Is Your Garage Ready for Winter? Think Safe Heating and Epoxy Coating! Thorough cleaning. All through the summer and fall, you and your family tracked in a ton of dirt and leaves. The wind blows in a lot of debris, too. Now is the time to clean it up. Remove all the clutter from the floor and the corners of the garage. Sweep out the dirt and leaves, and wipe down your cabinets and shelves. Safe heating. You may look forward to using your garage as an indoor workspace during the winter months. But, you should install safe heating methods specifically designed for your garage. A regular space heater may cause a fire. Depending on the activities you want to do, such as woodworking, painting or home office tasks, you will need different heating. Do not forget to consider radiant heating and other energy-efficient options that could be installed with your custom garage storage. Remember that ventilation is also important, if you intend to use a gas heater or perform activities with a great deal of fumes or dust. Epoxy coating. Winter is cold, but it is also damp. Your cement floor absorbs moisture from underground and conveys that dampness into your home. 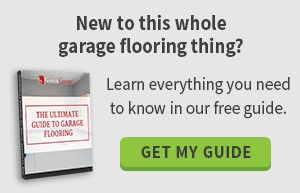 Add an epoxy coating to your garage floor to block out some moisture. You will have a nice, professional-looking floor, and you will help seal in the warm air at the same time. Air leaks. 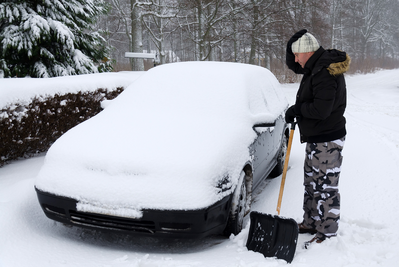 If you intend to keep your garage warm for household jobs during the winter, you must remove the air leaks. Check all windows and doors for cracks in the glass or frames. Save yourself the hassle now by replacing broken windows. You can seal simple air leaks using caulk. That way, you do not lose all your heated air out the cracks. Weather-stripping. If you want to reduce the likelihood of air leaks causing trouble in winter, take the time to put weather-stripping around your windows and doors. Weather-stripping means putting strips of various kinds of material around your window and doorframes, to provide additional protection from the cold. Made of plastic, metal, felt, foam or other materials, weather-stripping cushions your windows and doors for a tight seal that keeps the heat in. Garage maintenance is such a simple task, with important results. If you keep your garage clean and fix heating problems, you can use your garage all year round without worrying about freezing.